Introducing rhyming words is a great way to kickstart your preschoolers’ reading readiness. 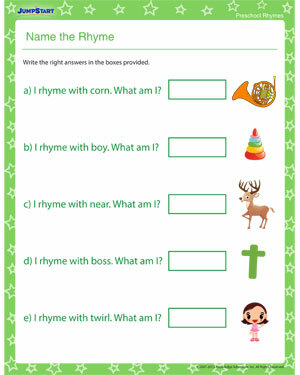 Use this free rhyming worksheet, ‘Name the Rhyme’ to show your kids how fun and simple rhyming words can be. Students must identify the pictures in the worksheet, using the rhyming words as a clue. A parent or other adult can help the kids write down the names of the images.